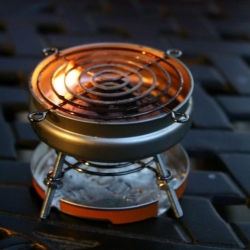 This mini BBQ grill made from Altoids tins is curiously awesome! HemDing is a really big platter, 18" diameter that you carry around via the handle of a garden shovel - a real one, to scale. Simple, bold and on sale. 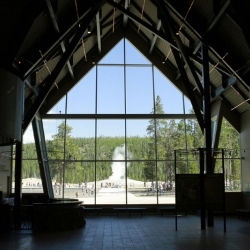 Just in time for Labor Day - Yellowstone just opened the doors of its new LEED Gold visitor education center! 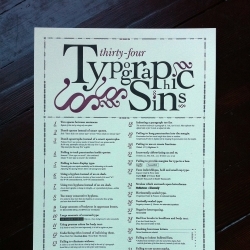 A bit more insight into the controversial 34 Typographic Sins Letterpress Posters. Repent before it is too late! 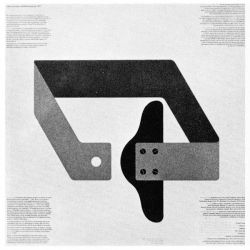 Architecture school is back in session, and in honor, Archtizer have rounded up old and new architecture posters spotted in the halls of some well-known US institutions. 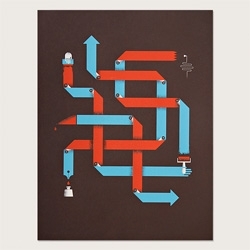 A series of unreleased books from the late sixties to the early eighties by The Infamous Press. Nikko van Stolk has come up with an innovative cellphone named the “Tactile” that makes use of a system of digital texture to let the blind access a multitude of features offered by modern multi-touch mobile handsets. 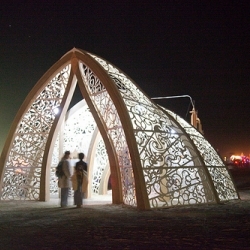 Amazing architecture installations from Burning Man 2010 - Metropolis: The Art of Cities. 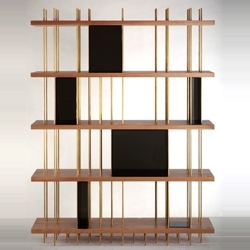 Serhan Gurkan's 'çok çok' bookcase. 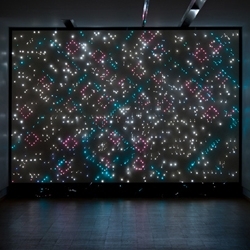 Astrid Krogh's new ‘light tapestry’ currently exhibited within her solo exhibition at Galleri NB in Viborg (DK). 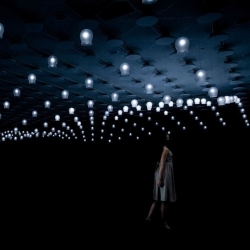 ‘Morild’ consists of a perforated wooden wall with illuminated spots, with ornamentally arranged fiber-optic threads. This is the Compass Phone by Hayeon Yoo, a device which both asks serious questions of the modern day cell phone and answers with an elegant alternative: itself. 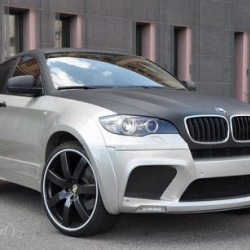 Enco Exclusive gave 2010 BMW X6 wider, brawnier, sportier look. FEATUREDThis week’s Notcouture roundup is effortlessly stylish, bringing you a glimpse of fashion’s finest. 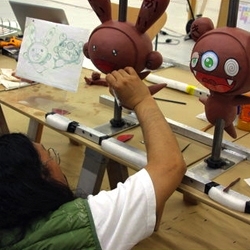 Murakami’s sketches and clay models of 'Kaikai' and 'Kiki' balloons for Macy’s Thanksgiving Day Parade. 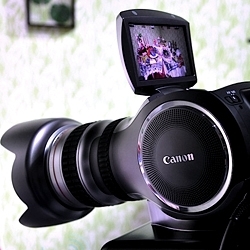 4k "Multipurpose" concept by Canon. 4k video, approximately quadruple the resolution of 1080p. 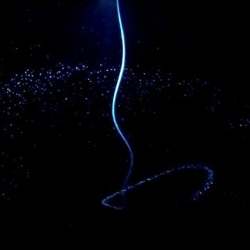 VIDEOVideo of Olafur Eliasson's 'Water Pendulum'. 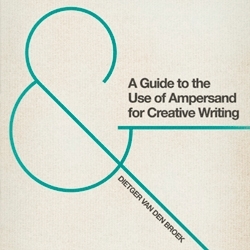 into a point of interest, a gathering spot, and a conversation. 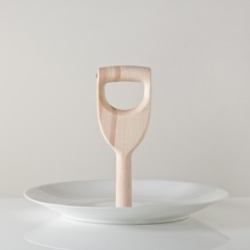 Trame, the new mirror designed by Inga Sempé for Domestic. Design group FRONT in collibration with Swedish ceramic company Höganäskeramik. 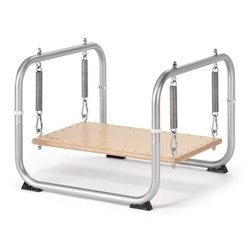 Show the new line of traditional och design products. 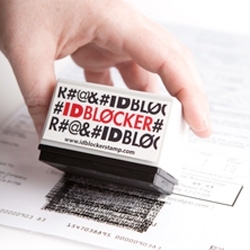 ID Blocker stamp ~ "The stamp contains thousands of tiny symbols that block out whatever is under them when you use it." 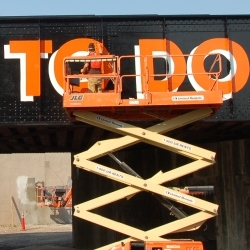 Let's just hope the ink isn't lifted off too easily! 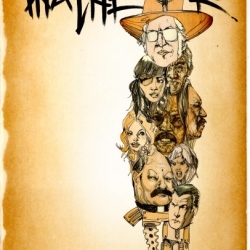 David Choe, Mister Cartoon, and SA Studios have all contributed to the design of these promotional posters for Machete, Robert Rodriguez's latest film, which opens Friday. 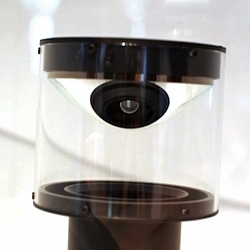 Canon's camera 50 megapixel CMOS sensor and aspheric mirror captures a sharp 360° image. 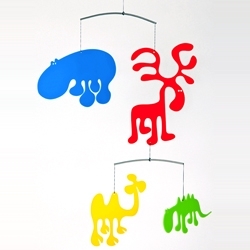 'Zoo' mobile by Eero Arnio. The architects at Bignatov Studio developed an unusual wall and roof motif that depict a tree branching out and taking root. The symbolism is well justified by the homes environmental footprint. 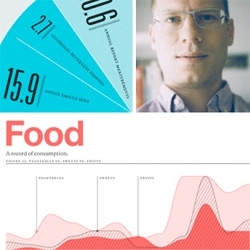 Great interview with Nicholas Felton - the man known for creating graphic breakdowns of every single detail of his life. 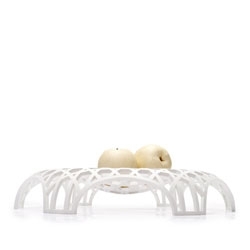 Scale 1/30 by Shigeru Ban is a limited edition center piece that is inspired by architectural projects. 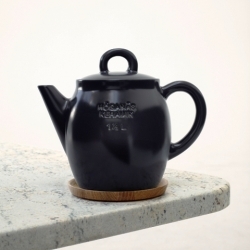 Limited edition by When Objects Work and on display at masion et object in September. 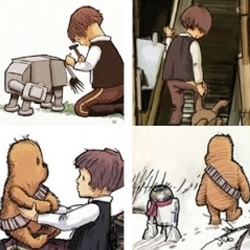 Absolutely adorable versions of Han Solo, Chewbacca and R2D2 as characters from Winnie-the-Pooh. 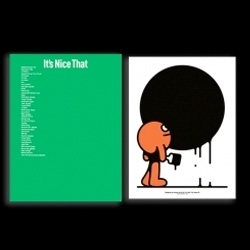 Issue #4 of It's Nice That is now available for pre-order. 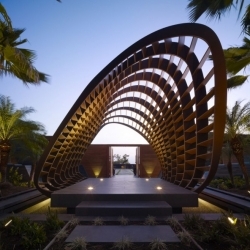 Kona Residence in Hawaii by Belzberg Architects. 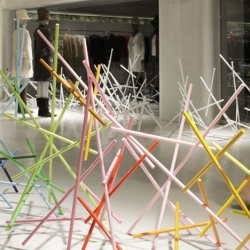 Gorgeous installations from Emmanuelle Moureaux installations of interlocking colored sticks at 3 Issey Miyake stores in Tokyo. 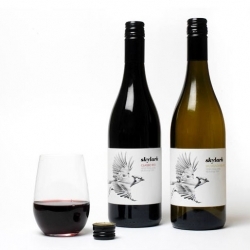 Furin, an interactive lighting installation by Takram design and engineering for Okamura Design Space R.
Inhouse Design's gorgeous labels for Skylark Wine with illustrations by London based Hello Von. 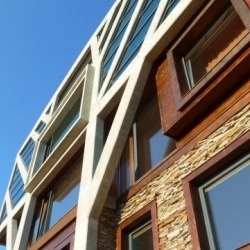 Dom Zlomu designed by Paulíny Hovorka Architekti. The concept of a single storey building with no stairs and the house is ideally in the form of L at the top of the site slopes to the level entrance. A modern and sustainable design of modular prefab can be found in v100 Mod Box. 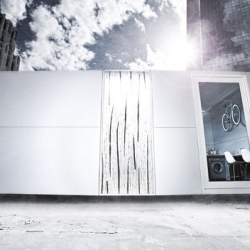 With a white color, this modular prefab can describe a modern and dynamic living environment. 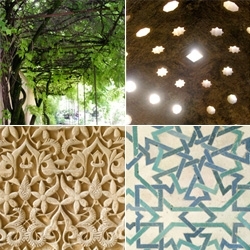 FEATUREDAlessandro Loschiavo Design gives us a peek into the beautiful world of Andalusia ~ so much inspiration from design details, patterns, and gorgeous color palettes! 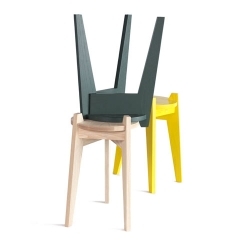 The Zuiderzee Stool by Studio Maarten Kolk & Guus Kusters is based on a simple milking stool located in the Zuiderzeemuseum depots. 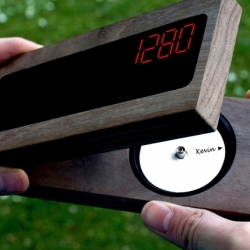 Blow in the ear to turn on the light- “Turn Me On” switch plate from Chris Haines. 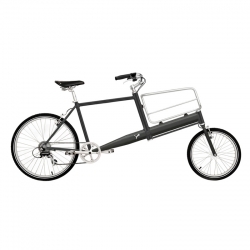 Today PUMA unveiled their new stylish Mopion bike, which features some serious cargo hold. 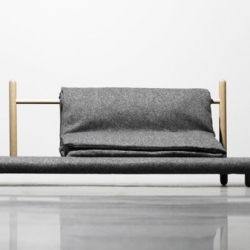 An interesting conceptual couch called Beddo by Christina Liljeberg Halstrøm is being displayed at the exhibition Designers Investigating in Øksnehallen (copenhagen). Daniel Andersson's icebergs concept takes vacation homes to new depths: this underwater living concept could have us rethinking the idea that land is the only livable surface. 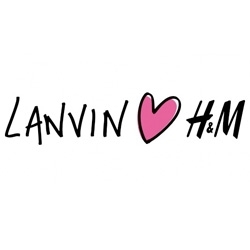 Can't wait anymore for the collaboration between LANVIN and H&M for this fall ! FEATUREDDominic Jones Jewellery - beautiful rhinoceros beetle rings i’m lusting after… an incredible shark’s jaw envelope clutch… some intense gator jaw cuffs... and more! 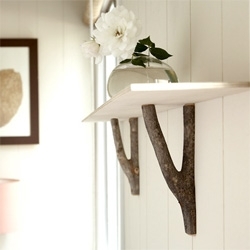 Live Wire Farm's wooden HOOKS! 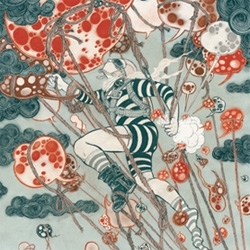 Inksie's Print and Production art print was made by Brent Couchman. 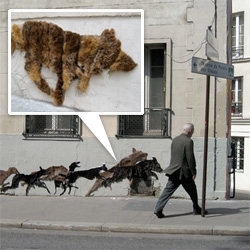 neozoon is a collective of female street artist that create wall art using old fur coats. the installations up cycle second hand furs cut into silhouettes of animals.